It's the monthly meeting of the Tohickon Garde Club. Amazing, the role food plays in these events. 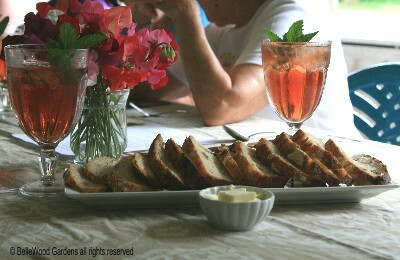 Meetings at the Stover Mill begin with refreshments provided by the hospitality committee. Sometimes food is more overt. 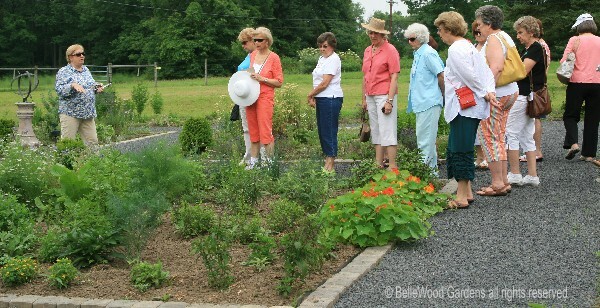 As this month, when we're having a garden tour and luncheon at The Kitchen Garden Cooking School in Erwinna, Pennsylvania where Sheila McDuffie teaches gardening classes, herbal and floral crafts, and cooking classes at her organic farm. Twenty-eight members signed up for today's event. As parking is limited we gather at various and sundry members homes, then take various ways to get there. No business meeting but there are things to take care of - a request was made for plastic bags needed for the plant sale in July. Duly noted and several people had bags of bags to hand over. Caladiums for the challenge class at the September flower show. A modest tailgate sale of a member's hand built pottery vases. These modest tasks attended to and we're ready for today's main event. is very attractive, but I think a decorative fence would set the garden off from the larger landscape. 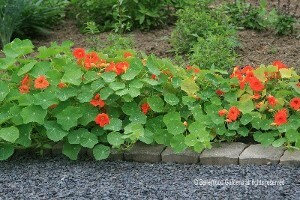 The nasturtiums made a bright splash of color, echoed by several members peach and coral hued clothes. 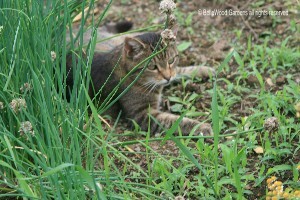 Lavender the cat was a most effective greeter, stropping against ankles and making us welcome indeed. 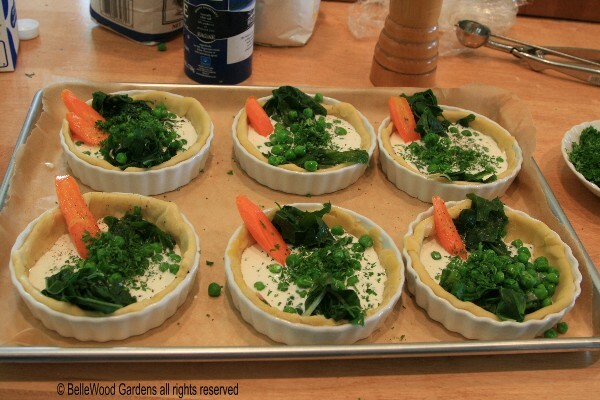 A quick glimpse in the kitchen where our luncheon: soup, salad, roasted vegetable tart is being assembled. And let us not forget dessert. 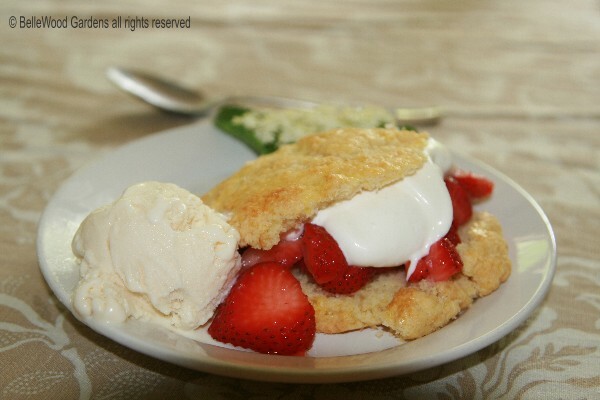 Lavender shortcake with strawberries. 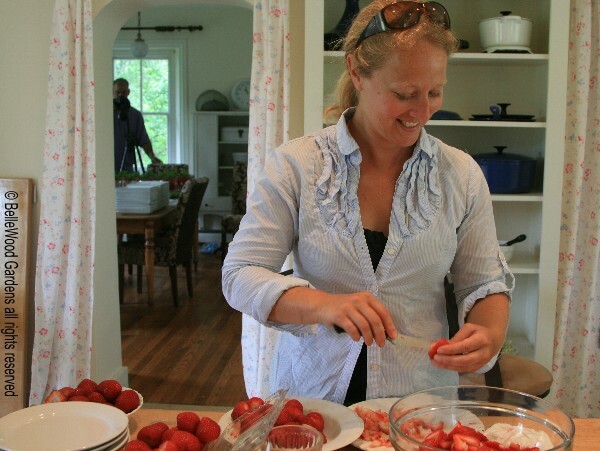 Lots of strawberries. It's clearly a working kitchen. Form and function, and beauty. 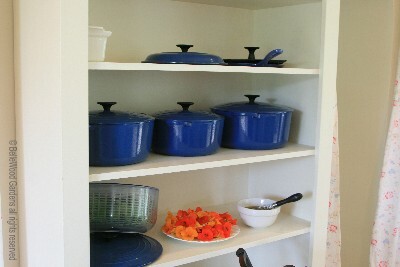 An open cupboard of blue Le Creuset pots, and nasturtiums. Cooling loaves of delicious bread. 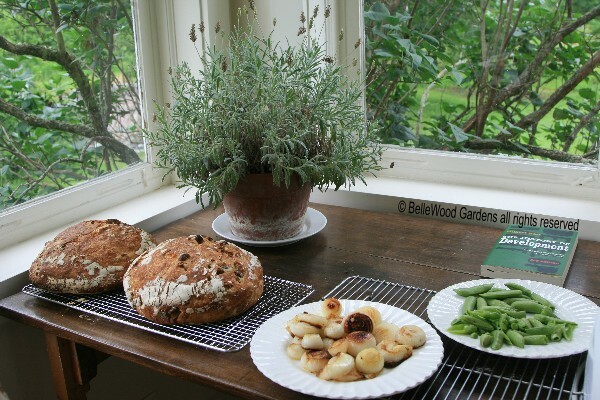 One of Sheila's classes is bread baking from the no-knead recipe. Students bake several different versions, and go home with suggestions for 50 variations. while the last minute details of cooking / roasting / plating is accomplished. 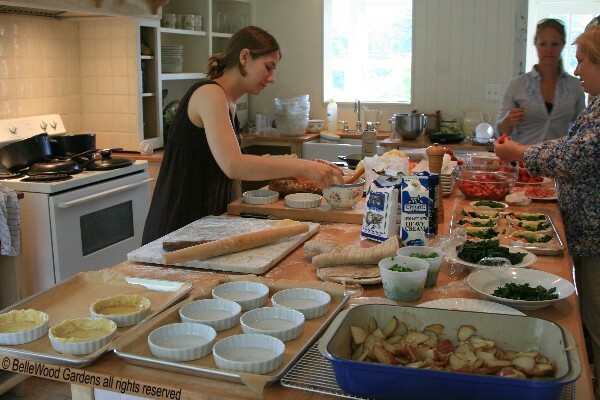 Everything works at The Kitchen Garden Cooking School. 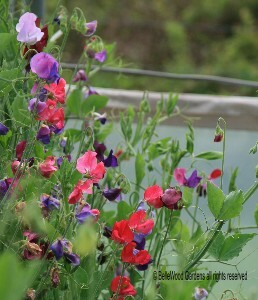 Sweet peas in the greenhouse are cut for bouquets. 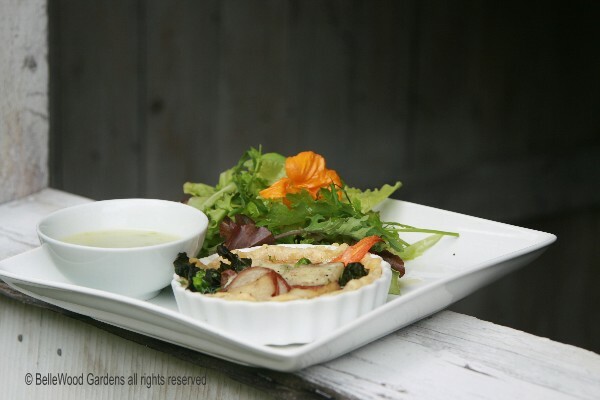 with a vibrant nasturtium flower, bright contrast to the spring greens soup and roasted vegetable tart. of oWowCow Creamery vanilla ice cream. 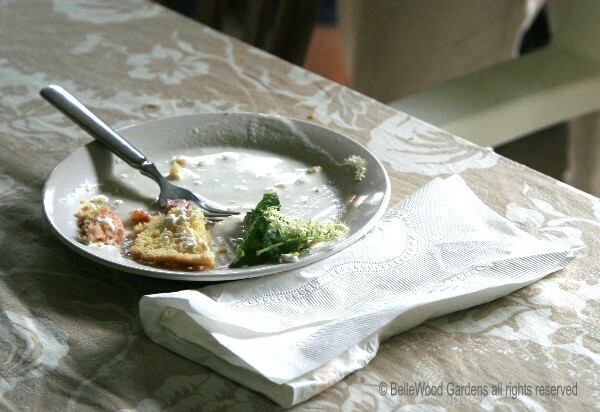 A nibble, some conversation, another taste - surprise! all gone. A pleasant outing. A good time had by all. And all agreed that tonight dinner would be something light.